Foreword. Glossary. 1. Commodity Review. Introduction. Geological association. Technical applications and industrial uses. Marketing and investment role. Strategic role. 2. Controls on Sulphide Solubility. Introduction. Predicted Controls. Experimental Studies. Application to Natural Rocks. 3. Pyroxenes. Chemical classification. Pyroxene immiscibility and exsolution. Electron microprobe analysis of exsolved pyroxenes. 4. Phase Chemistry of Mafic Magmas: Primary and Secondary Processes. Silicate phase fractionation. Stable isotope geochemistry. PGE mineralogy. 5. Mining Geology of the Principal Deposits. Bushveld Complex. Sudbury nickel irruptive. Komatiite-hosted nickel sulphides. PGE deposits in the USSR and China. Stillwater Complex. 6. Target Selection. Geological environments. Intrusions in cratonic areas. Bodies emplaced during orogenesis. 7. Exploration Guidelines. Analytical techniques. Lithogeochemistry of the Bushveld Complex. Application of lithogeochemistry. PGE concentrations in magmatic sulphide ores. Primary and secondary dispersion. Remote sensing and geophysical techniques. 8. Evaluation Guidelines. Geostatistical ore reserve evaluation. Economic modelling. 9. Summary and Conclusions. Exploration and investment climate. Chemical factors. Primary PGE associations and controls on mineralization. Exploration guidelines. Bibliography. Index. 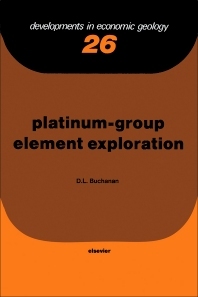 The platinum-group elements (PGE) include platinum, palladium, rhodium, ruthenium, iridium and osmium. They are currently receiving world-wide attention as an attractive exploration target because they offer the dual attraction of rare, high value precious metals as well as major industrial applications. Platinum has aesthetic qualities, combined with a permanent lustre, which encourage its use in the manufacture of jewellery and, like gold, it also finds an investment role. Platinum, rhodium and palladium have important applications as catalysts, enabling petroleum and other fuels and chemicals to be produced efficiently from crude oil. This book gives a practical set of guidelines for implementing a programme of PGE exploration, detecting subtle indications of mineralization and assessing the economic potential of a group of mafic or ultramafic rocks. Background material is given on the economic and geological framework of the PGE in the first chapter, while theoretical aspects of magma chemistry are covered in the next three. Chapters 5 and 6 review current world-wide exploration activity within the context of available reserves of PGE, and in Chapter 7 factors which need to be considered in exploration for new deposits are outlined. The last chapter discusses evaluation guidelines. As the PGE are both costly and almost indestructible they are normally recycled; nevertheless, a substantial annual input of new metal is needed to replace process losses, to permit increases in capacity in the dependent industries and to provide for new uses. For example, a major new market for platinum will be created if the European Community countries are required to fit catalytic converters to new cars. At present, South Africa and the USSR are the sources of most of the western world's newly mined PGE, with virtually all the South African production derived from the Bushveld Complex. Much of the material presented in this book is based on the author's experience of these rocks, and emphasis is given to the dominant role played by magmatic sulphides as potent collectors of PGE. Consumers of minerals and metals, however, prefer to have a diversity of supply and a new PGE producer is therefore likely to attract a ready market. Not only does the book provide a wealth of practical information for mining geologists, it also contains much of interest to those in natural resource management and investment.